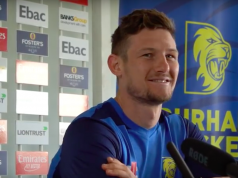 A year ago, James Harris’ career had fallen to its lowest ebb, returning to Division Two side Glamorgan on loan in search of finding the form that at one point had him mentioned among England hopefuls. But at Lord’s, in a game that had progressed like Newton’s cradle, shifting momentum one way and then the other, Harris rode in on a wrecking ball to break Durham’s chase to pieces. Needing another 224 runs to win the match, with only two wickets down, Paul Collingwood’s men crumbled under the menace of Harris. Running in from the Nursery End, wind howling in his face, he severed any hope Durham had of winning their third consecutive Championship game, finishing the match with a career-best 13 for 103. Courted by many ahead of the 2013 season, when he departed Glamorgan in a bid to play for England, Middlesex eventually signed him. But after discussing with the national hierarchy how best to improve his bowling in an aid to become faster, he suffered a loss of form. Reoccurring hamstring injuries hampered his progress further, but it wasn’t until accepting the attempted alterations to his bowling had not worked that he began to discover his previous best. A move back in the middle of last season to the action – both arms raised together – that brought him so much success, enhanced by winter work in the gym and indoor school alongside Middlesex bowling coach Richard Johnson, saw him record the best bowling figures at Lord’s since Gubby Allen’s 10 wicket haul in 1929. “We went searching for a lot of things,” Harris said of his bowling. “We changed a lot of things, and we probably found the half a yard we needed but it was to the detriment of skill and moving it around. “I tried to be better, it didn’t work, simple as that. I had to bite the bullet and go back to what I knew and what made me successful in the first place. There was no warning of Harris’ destructive spell for the handful of spectators fortunate enough to be at Lord’s when Michael Richardson drove Steven Finn in the second over of the morning for four. But seven balls later Harris had Richardson’s stumps spread-eagled to start a collapse that saw Harris claim five wickets for five in 16 deliveries. Bringing one back in to Calum MacLeod, Harris struck him on the pads to depart for a duck. Paul Collingwood succumbed the very next ball. Batting out of his crease, trying to negate any movement, he chopped Harris onto his own stumps. And while Phil Mustard managed to survive the hat-trick ball, Harris prevailed in his next over, clipping the outside edge for James Franklin at second slip. 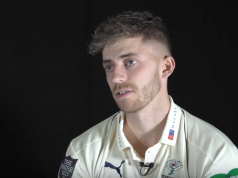 By the time Scott Borthwick went three balls later, edging to Adam Voges, Harris had surpassed his 2014 Middlesex wicket tally in almost half the number of deliveries. The overnight score of 24 for two tumbled to 39 for seven inside the first six overs of play. Finn, another Middlesex trying to find the rhythm that has deserted him since national call-ups, prevented a Harris 10-for, picking up the wicket of Usman Arshad caught by Sam Robson at gully, before Harris trapped John Hastings to have Durham dangling 14 runs short of their lowest ever first-class total. 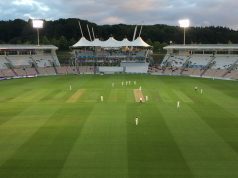 A final wicket partnership between Paul Coughlin and Chris Rushworth managed to retain some dignity, taking them beyond that lowly record, but Harris wrapped up the match removing Rushworth to put Middlesex top of Division One.